Opposition MK speaks to Congress, Senate, tells them to support Trump's decision to leave UN Human Rights Council. 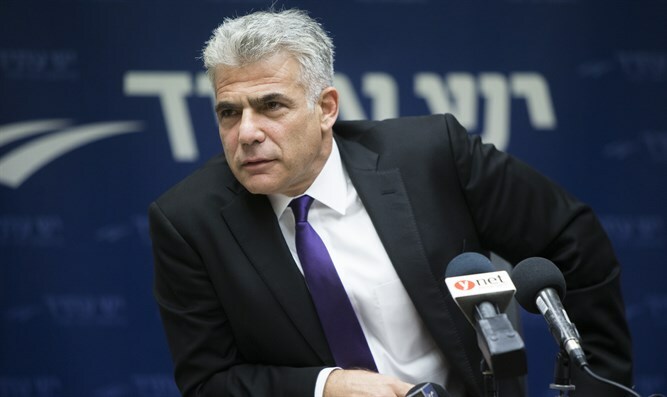 Responding to the extensive anti-Israel campaign led by the United Nations Human Rights Council, Yesh Atid Chairman Yair Lapid on Sunday morning called on Democratic and Republican Congress and Senate members to support US President Donald Trump's withdrawal from the UNHRC. "The fight against the de-legitimization of Israel needs to cross all political boundaries," Lapid said. "And the UNHRC is at the very heart of this anti-Israel effort. "One year ago, I stood outside the UN Human Rights Council with hundreds of people from all over Europe. We stood there in protest of the UN's continued bias against the only Jewish state in the entire world. "Immediately after the protest, I called on Congress to halt funding to the UNHRC. Now that the US government is considering exiting the Council, I hope we will be able to count on our friends in the Senate and in Congress to support this step." On Sunday morning, it was reported the US will be leaving the UN Human Rights Council after the Council slammed convicted IDF soldier Elor Azariya's 18-month sentence as "too light" a punishment. Azariya was convicted of manslaughter in January, and sentenced on Tuesday to 18 months in prison for shooting a terrorist suspected of having an explosive vest.